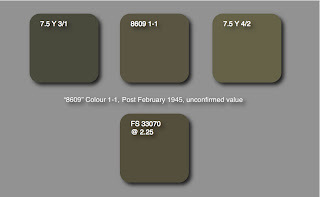 A JAAF paint colour that can still be confusing for artists and modellers is the late war olive brown # 7. Previously described as "late war brown", "Home Defence khaki", "khaki black", "deep green brown" and several other approximate descriptions, it has been depicted as everything from a strong reddish-brown to a dark, chocolate brown hue. Factory painting with this colour was ordered for all Army aircraft in June 1944 but did not begin on most factory production lines until August/September that year and in some cases later, such as for Hayate, in approximately October 1944. An advisory marking for the finish, a "cartouche" giving coded warning about the inflammability of the cellulose-benzine paint, was at first usually applied to the port rear fuselage but is not always visible in photographs and in any case was not continued as part of the factory painting. On Kawasaki aircraft this marking usually consisted of four characters 迷彩塗料 (mei sai to ryou - literally "illusion colouring paint material" meaning "camouflage paint) stenciled within a rectangular box but varied from manufacturer to manufacturer. The official name "yellow-green" provides the clue, because it is a yellow infused olive green or olive brown exactly similar to the British khaki drab battledress of WWII. "No.7" was probably included in the description to differentiate it from another yellow-green colour # 29 (黄緑色 - ki midori iro) - a "pea green" hue used to paint interior parts and drop tanks. The variable range of the olive brown # 7 paint colour typically runs from the strong olive of 7.5 Y 3/3 to the barely olive brown of 2.5 Y 3/2. The closest FS to both extremes of this range is 33070, but this value is not quite green enough for the "olive" end of the range and not quite brown enough for the "brown" end. The closest FS comparisons to this range of colours generally lack the warm (and strong) yellowish-green chroma and the same is true of many hobby paints. 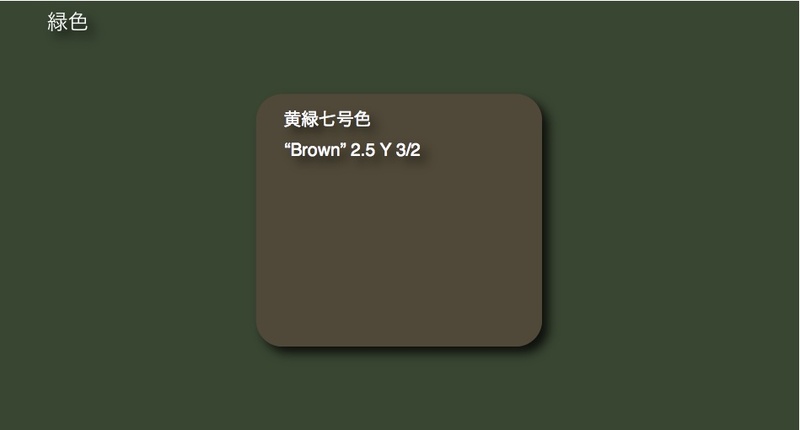 Some Japanese researchers suggest an FS equivalent of 30118 for this paint colour, especially for Mitsubishi-built aircraft, but that does not seem typical of the colour on the whole, except possibly for a very badly faded example at the extreme "brown" end of the range. The idea probably originates from the N. Shimoune colour matching of Munsell 2.5 Y 4/2.8 for the upper surface paint of the Ki-67 and Ki-46 III. FS 30118 is similar to this Munsell value but not the closest (that is FS 33105 @ 3.61). This warm, yellowish brown hue stands out rather starkly from the general character of the olive brown colour represented by the rendered chips shown here. The same researcher suggested 7.5 Y 3/1.5 for the upper surface colour of the Tachikawa-built Ki-43-III Ko, Ki-54, Ki-74 and Ki-94, which moves in the opposite direction, towards a rather dark variation of # 7. 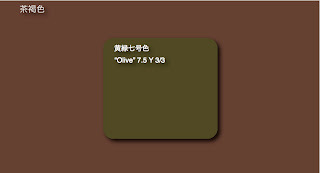 At the olive end of the # 7 range the green chroma appears quite strong until it is compared directly to the pure olives typical for example of JAAF paint colour # 21 green (緑色 - midori iro) which appears in several hobby paint ranges as "IJA Green" at which point the difference can be appreciated. 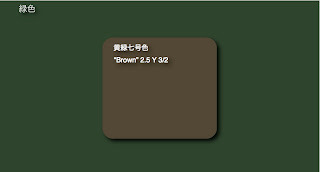 The colour is highly metamerismic as may be seen from the juxtaposition of the olive extreme to pure brown (in this case tea brown (茶褐色 - chakasshoku) and the brown extreme to pure olive green. It is the green/brown conflation of this colour range which causes the most difficulty in visualising it, with a tendency to perceive it either as a definite green or more usually as a definite brown. The reason for this is/was two fold. Firstly, the metamerismic qualities meant that the same colour seen against, say, a bright green grass field or tree line might look more brown to an observer, whilst when seen against, say, a dusty, sun-baked earth field it might appear more olive green. Secondly, as with the RFC PC10 of WWI the proportion of constituent precipitated ferric oxide pigment to cellulose binder affected the degree of "brown" appearance. The pigment itself was precipitated from a yellow ochre to a reddish brown hue and the manufacturing methodology at the time probably introduced an inevitable inconsistency in the final product. Compared to US Olive Drab the colour, though similar, is somewhat richer and more intense but in service it faded rapidly to a lighter khaki drab, representative of the somewhat unsaturated colour values of FS 34088 or Thorpe's A2. Waxed and polished the paint took on a darker, greener hue. Very dark variants, such as that found on the Kizarazu sample from Sgt Maj Yasuo Takeshi's Ki-100 begin to approach a dark greyish brown, almost towards charcoal in appearance, and which are described in Japanese as 黒褐色 (kuro kasshoku) - meaning black(ish) brown colour. 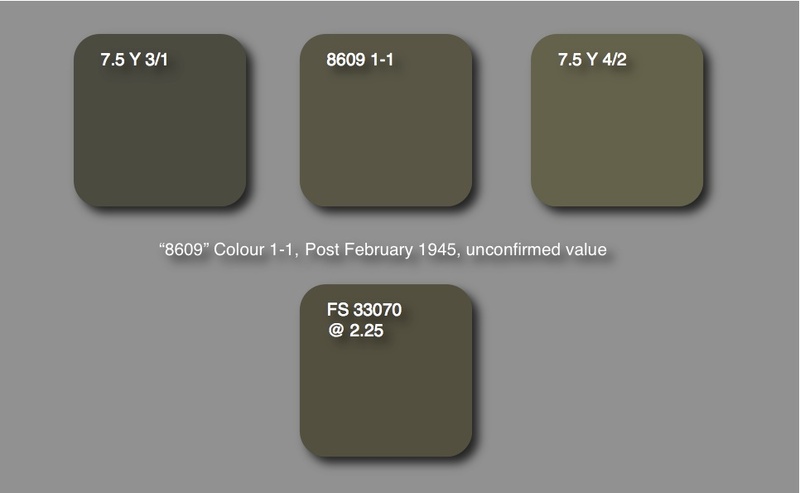 After February 1945 the # 7 colour was subsumed within the new 8609 consolidated paint colour standard for Army and Navy aircraft as colour 1-1, (significantly part of the "Greens" section). The 1-1 colour has been matched to be about mid way between Munsell 7.5 Y 3/1 (which is towards the black(ish) brown, and 7.5 Y 4/2, but I have not been able to confirm this by a measured value. The colour equates to approximately 7.5 Y 3.5/1.6 which is close to the Tachikawa factory paint colour and our old friend FS 33070. 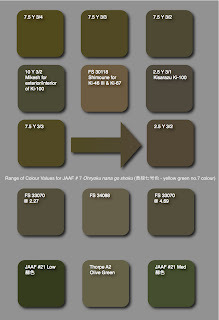 An important colour for Japanese aircraft artists and modellers, # 7 and 1-1 was the late-war factory paint colour for the Ki-43-III Ko, Ki-45, Ki-54, Ki-61, Ki-74, Ki-84, Ki-94, Ki-100, Ki-102, Ki-109 and Ki-67. 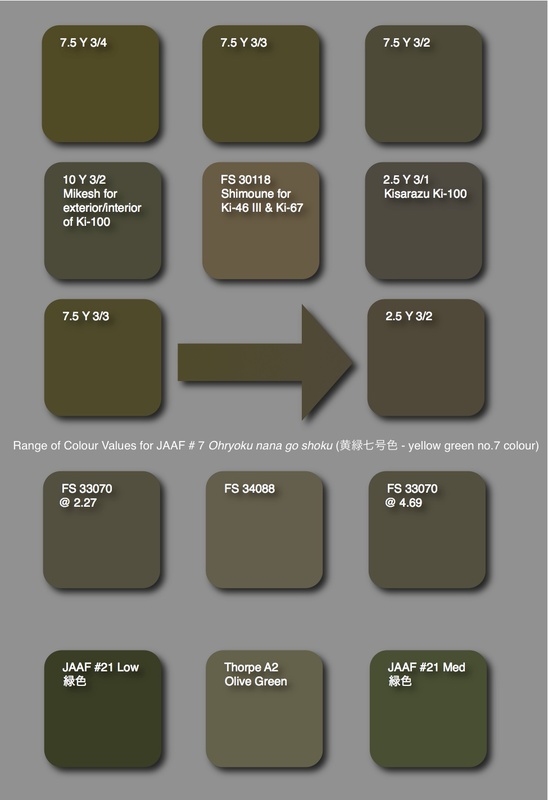 There is more to it than simply "IJA Green", but as with most Japanese colours to understand the "character" of the paint colour and to accept its variations are a better route than agonising over an exact and precise colour. Thanks Nic on a another good article. That ki midori iro - would that be the green I see on Ta.Gucci Ki-10 interior drawings in Arawasi special? Thanks Vedran and Dan, glad you found it interesting and useful - hopefully others did too. Vedran, dunno I'm afraid. Dunno what was intended but the dark blue-grey or aotake was probably more probable given the timeframe. Nick, you really need to write a book! Thanks Jeff, but I think the approach I take is appreciated by very few. Mostly it is unwelcome, especially on the forums. The proportion of visitors who post positive comments is only about 4% and I get almost as many very nasty anonymous messages so I have to question the time spent preparing and sharing the data to the level of value put on it. Most modellers seem to want to just talk about hobby paints and have very firm preconceptions, preferences and prejudices which are not to be moved by any inconvenient scientific facts. In a few days time this blog will celebrate its 3rd birthday. That will be a good time to decide whether to continue it or not. Or perhaps to make it a membership site for those few who are kind enough to comment and engage positively. I am sorry to read that others leave negative comments after seeing your work. Your site is one of few that I can refer to to gain info on Japanese aircraft colors. I really appreciate the color chips and scholarly presentation. I have referred your site to several modeler friends. Please press on, your work is appreciated. Thanks the for the very kind comment Larry. It is good to know that the data is of use. Have any of your sources indicated when IJA #7 Ohryoku nana go shoku 黄緑七号色 - yellow green no.7 colour was first put into use? Good question. I thought I had mentioned this but now realise that it was in a thread about the Ki-44 at j-aircraft.com! I have updated the blog post with this information - in the first paragraph. Your site is not only most helpful, but most interesting to read. another very interesting post. I can only agree with others, your info is most valuable. I definitely believe you should write a book. Keep up the good work.